When I was working on the baby’s nursery I knew I wanted something personalized in the wall art. I didn’t want something as obvious as a giant monogram, but something that was more subtle and would blend in with the ‘nautical’ theme. I knew that ships use standard International Maritime signal flags that represent letters of the alphabet. I thought that would be the perfect solution. To display them I thought I could replace the photographs in my clothesline frame with mini fabric signal flags. I sewed them together and I was left with little flags that had unfinished edges. I sandwiched the flags (right sides together) with a square of white fabric exactly the same side and sewed around the edges leaving a 3/4 inch space on the bottom. I hung them on the twine frame using alligator clips making sure I had them correctly oriented. Right above Josh’s crib. I love how personal it is, but unless you are a boat captain you may never know it! This is a very cute project, Kim! I had no idea a flag alphabet existed. I love the whole room! Absolutely adorable!! You are so creative. How cute!! What a great idea and I love how the room looks! Such a cute idea. 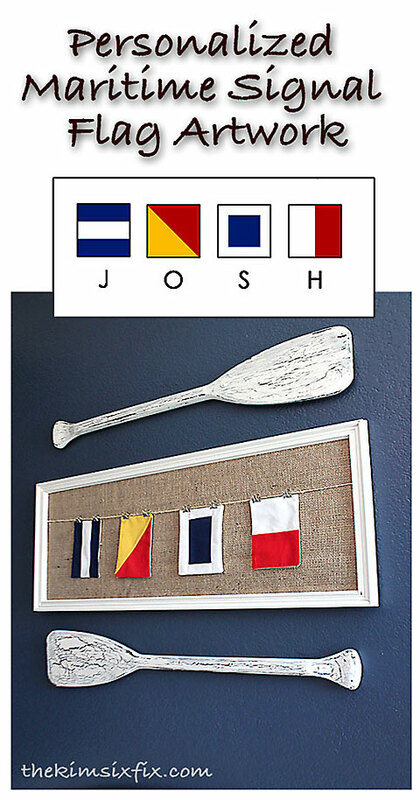 I love the nautical look and the flags make a great touch.